DIAL: Grey ‘gradient’ dial with day & date window at 3 o’clock. Applied hour markers with tritium luminous plots. Rotating metallic minutes diving ring with tritium triangle at 60 mark. Red hours, minutes seconds hands. Hour/Minutes with tritium luminous sections. 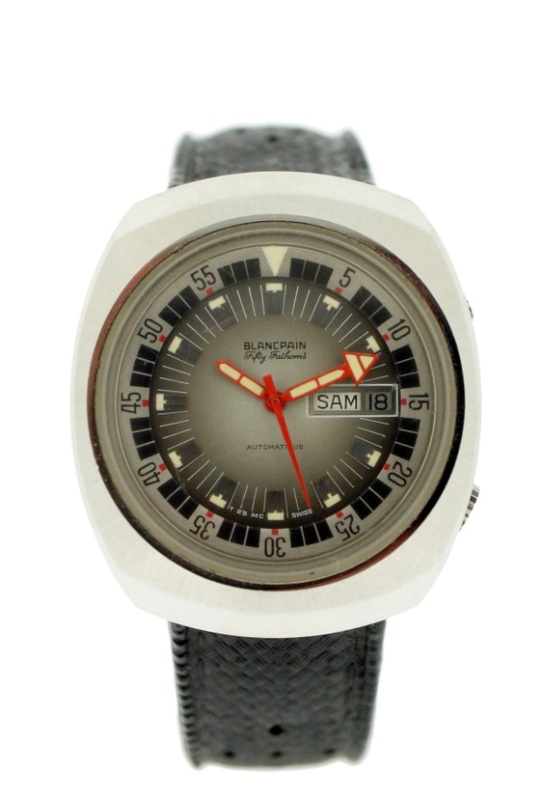 Dial signed Blancpain Fifty Fathoms, T25 MC SWISS printed at the bottom, automatique also indicated on the dial. CASE: 40mm stainless steel, screw down caseback, mineral crystal, double crown at 2 o’clock to rotate diver 60-minute bezel and at 4 to pull and set the time. CONDITION REPORT: The dial and hands are original and in excellent condition. The case is in good condition with some minor scratches but appears to be unpolished. The mineral crystal has some light scratches but is original. Overall the watch is in great original condition. NOTES: Under the 30 year tenure of CEO Jean-Jacques Fiechter, an avid diver, beginning in 1950, Blancpain developed its first real diving watch. The name Fifty Fathoms, the equivalent of 91.45 meters, was the depth rating for the watch. It was developed with specifications and collaborative efforts of the French Combat Diving School. The release took place in 1953, one year before Rolex released the Submariner. Following the French Navy, other militaries followed suit including the Spanish, German, Israeli and US Navy. Of course the US Navy bid would have never been won under the protective Buy American Act without the help of Allen Tornek. The Fifty Fathoms had many innovative features in its development using radioactive Promethium 147 for its large luminous markers and even adding a humidity indicator on the dial to warn divers of any leaks. This iconic model is now a collector icon and with so few remaining in circulation, prices have climbed and continue to climb considerably.